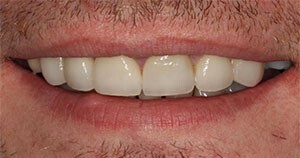 Broken, worn down and misshapen front teeth can benefit immensely from porcelain veneers used to restore their shape and form. 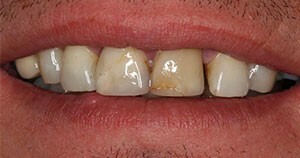 Veneers are also occasionally used alongside whitening to restore the colour of an unnaturally dark tooth. Sometimes veneers are sought by patients, but it is possible to achieve their desired result by simply bonding some colour-matched filling material to their teeth. Accurate diagnosis of their problem and expert application of the appropriate technique are critical for the best outcome. After completing training as a dentist Dr Luke Rickman then completed a Master of Science Degree in Prosthodontics (University of Manchester, UK), which is the study of repairing and replacing teeth. He works closely with a master dental technician in the neighbouring suburb of Richmond to ensure all veneer work is of the highest quality.